Trump signed an executive order requiring that the departments issue regulations to remove regulatory hurdles that keep small businesses from coming together to form what are called association retirement plans. CHARLOTTE, N.C. — President Donald Trump on Friday directed the Labor and Treasury departments to work to make it easier for small businesses to band together to offer retirement plans to their workers. 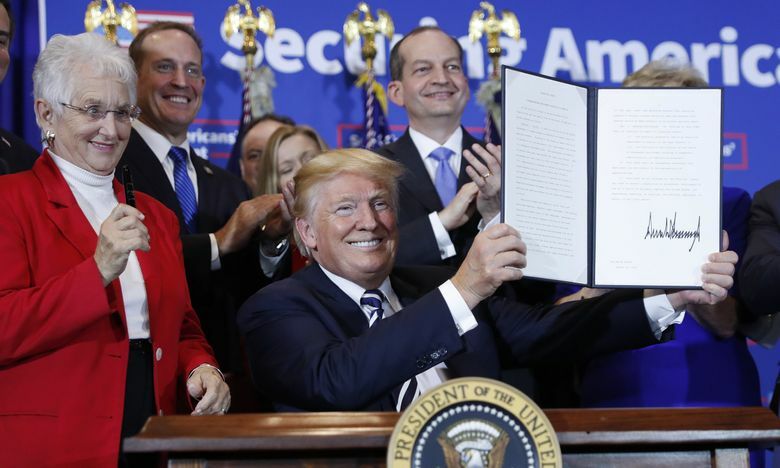 Trump signed an executive order requiring that the departments issue regulations to remove regulatory hurdles that keep small businesses from coming together to form what are called association retirement plans. He said the cost of administering 401(k)s and other plans discourages small businesses from making them available. Most Americans use plans offered by their employers to save for retirement. But about one-third of all private-sector workers, and just under a quarter of all full-time workers in the private sector, lack access to workplace-retirement plans, James Sherk, assistant to the president for domestic policy, told reporters Thursday. About half of workers at these businesses don’t have access to retirement plans, Sherk said. He referenced surveys in which more than one-third of small- and medium-sized business that don’t offer retirement plans cited high costs as the main reason. The mutual-fund industry has lobbied for years for regulatory changes that would make it easier for small businesses to offer 401ks and bring more savers into the retirement system. Legislation backed by both Republicans and Democrats is pending on Capitol Hill that would have a similar impact to the Trump directive.